This is my fourth blog post at Unemployedpinoys.com. Please click here to read the whole story. SELFIE – Good or Bad? This is my second blog post at Unemployedpinoys.com. Please click here to read the whole story. “Selfie. A word coined by someone I do not know. I just woke up one-day morning and met SELFIE as a word that describes a moment, a moment alone with my camera. This is my first blog post at Unemployedpinoys.com. Please click Read more to read the whole story. Thanks! One Wednesday morning, Metz jumped into her computer after eating, cleaning the house and washing all the dishes. She went to her Gmail to check some emails and she saw a message from LinkedIn says “Congratulate Mary Jane Adlawan” so she open the message and went to LinkedIn to Congratulate her Collage Classmate for her new job. Metz was surfing the LinkedIn platform again. “Oh! It’s been a while!” she said. She went to her inbox because she got a recommendation from Sunday William (her coworker) and she gave Sunday a recommendation back. 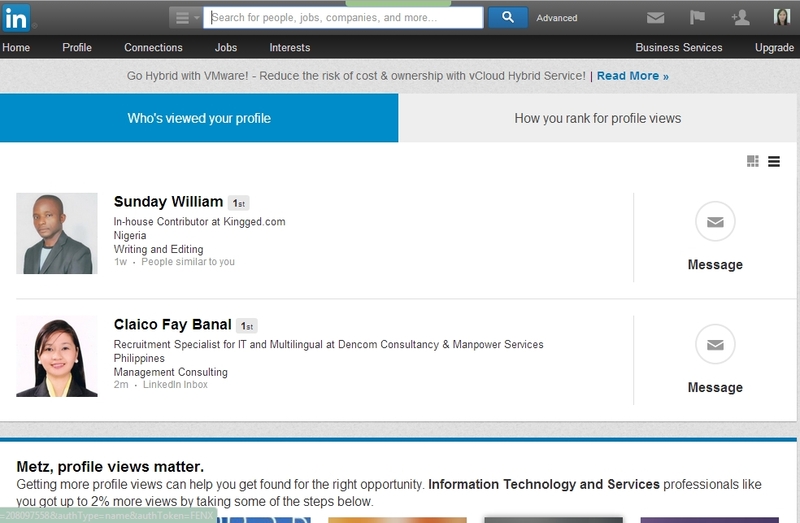 All of the sudden, LinkedIn’s video popped up! Introducing the new Who’s Viewed Your Profile. There, you will see “Who’s viewed your profile” and “How you rank for profile Views”. Under the “Who’s Viewed Your Profile?”, there, you can see how many times you have shown up in the LinkedIn search results.